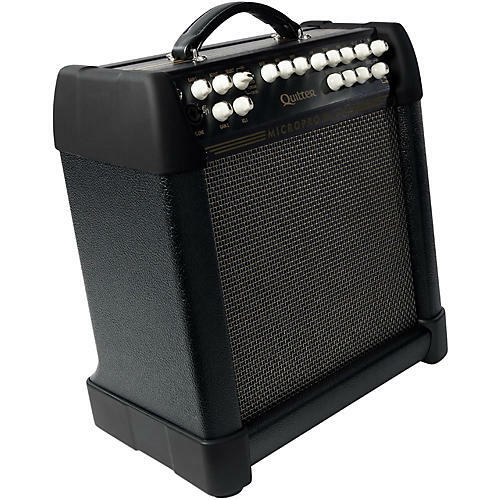 Massive power and Celestion sound from a super-portable 1x10 combo. The Quilter 10-in. Mach 2 combo is the choice for those looking for a more vintage, "chewier," and "rounder" sound. A smart compromise between the light weight of the 8 and the heavier weight of the 12, the 10-in. features a very potent Celestion G10 Vintage driver. In Quilter's sealed enclosure, the 10-in. Celestion delivers warm and beautiful mids with a deep and resonant low end articulation. Best for electric instruments, especially when they are overly bright, the 10 inch delivers warm and uncompromising tone. If you already have a 10 inch speaker that you love, or if you are used to the sound of a 10 inch, this is your amp. Combine this with Quilter's 12-in. extension cabinet for staggering power that will easily handle outdoor gigs without a PA system.